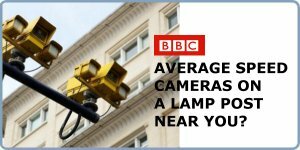 Average Speed Cameras on a Lamp Post Near You? Following the government's budget cuts, Somerset County Council took the first step towards switching off all of its fixed speed cameras last December, targeting completion this April. Avon and Somerset Police said they would take over the running of just the mobile speed cameras from April. But it has now emerged that police may also operate average speed cameras, replacing the fixed cameras across the area. It's proposed that ANPR (automatic number plate recognition) average speed check cameras would be positioned on lamp posts to catch speeding drivers. The BBC obtained e-mails through a Freedom of Information Act request which show discussions were made late February about the possibility of the fixed speed cameras being replaced. Are you suggesting the police are going to add ANPR to the existing average speed cameras or put up average speed cameras with built in ANPR on any lamp post. As I understand it, ANPR is used to find and catch untaxed and or uninsured vehicles, which I applaud. As it stands, personally I don't have a problem with average speed cameras, it's fixed speed cameras I have issue with. If you are going to have a speed regulation, it needs to be policed. IMO, laws and regulations un-policed are worse than useless. Hi John and welcome to the forums! By the looks of it, the latter. From the BBC story: "In the e-mail Mr Baille said: "He [Mr Lewis] wants to put ANPR [automatic number plate recognition] cameras up - in pairs - on lighting columns and link them to a system for average speed measurement." That makes sense,, as average speed cameras use a form of ANPR to capture the number plate of a vehicle, however it would have to be on a stretch of road where vehicles are kept to one continuous run other wise they wouldnt work. Lets face it, in reality the police are losing out on fines since the cameras are being turned off and need someway to fund their annual xmas party and the Chiefs brandy and cigars or am i just being cynical. If that's that's case, I can see cameras on the garden gate not too far in the future. One wonders then, whether authors like George Orwell were prophetic or influential in their writings. A bit of both I reckon! however it would have to be on a stretch of road where vehicles are kept to one continuous run other wise they wouldnt work. Not neccessarily, but it will only catch the ones that have kept to the continuous stretch, and have exceded the speed limit. Sorry M8TJT i meant to say one continuous stretch with no exits or place cameras at the exit points as they have done on the M60 at Brinnington in Stockport near me.